I am writing this post for all my friends who have recently participated in the discussion or presentation of Art Nouveau and/ or Art Deco. I just came back from a cruise. There was a game called Art Jeopardy. I participated, and won! There were questions on artists, art history, art movements, museums etc. I did not get every answer right, but I did get this correct: there was a question on art movement. The answer was Art Deco, and I was right! Of course I also made big “bets” and therefore I happened to be the winner! 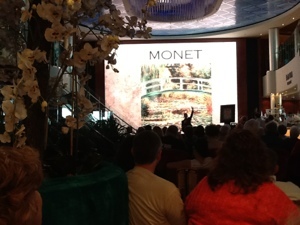 Then I attended the art auction…and of course I bought something….had to break my bank! That’s the cost …being a winner!! Well, I did have fun on the cruise. This was one of the highlights. Thanks to all of you who gave me this learning opportunities about Art Nouveau and Art Deco. As I mentioned somewhere in other blogs, I did not learn about art formally in school, but I am a lifetime learner. Art was my first love, and it would forever be one of my love affairs! Thank you all! See you later! 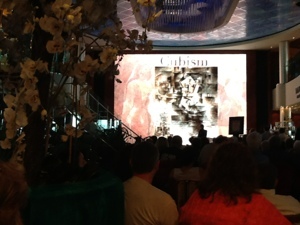 These are two pictures showing an art introduction program on the cruise. I did not take picture of the Art Jeopardy because I was a participant. Congratulations on winning, it sounds like a lot of fun! Thanks so much! It was fun.